When you lose teeth, you can face a number of daily inconveniences and challenges. For example, chewing properly may be difficult. You could face embarrassment in social situations. Your oral health may also suffer devastating consequences. Modern dentistry offers a number of ways to correct and prevent such problems, the most outstanding of which is dental implants in Herndon. If you are missing one or more teeth, Dr. Bakhtyari may recommend that you undergo this treatment in order to regain a complete, healthy smile. Comprehensive tooth replacement. Implants replace the roots of missing teeth, while a restoration (crown, bridge, or denture) replaces the visible portion of the teeth. Other treatment options only replace the top part of the teeth. With proper care, dental implants can last for 30 years or longer. Their restorations may endure for at least a decade. A high success rate. The implant procedure is successful in over 95 percent of cases. A strong bite force. The bite force that implants provide rivals that of natural teeth. Implant restorations are made out of high-quality materials, such as porcelain or acrylic, that closely resemble natural teeth. Protection for natural teeth. Dental implants can prevent your remaining teeth from drifting out of place, helping you to maintain a well-aligned bite. They also do not usually require that natural teeth be modified or extracted. Dental implants near Oak Hill are a versatile treatment. Whether you are missing one tooth, a few teeth, or all of your teeth, they may be an appropriate solution for you. 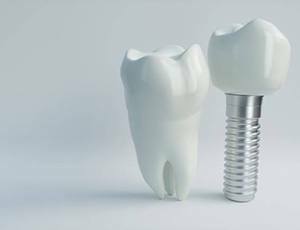 A single dental implant, topped with a single crown, is the best way to replace one missing tooth. An implant-retained bridge is an excellent way to replace multiple missing teeth in a row. 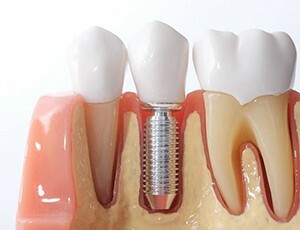 It consists of two crowns, which are attached to dental implants. The crowns support an artificial tooth (or teeth) between them. If you are missing all of your teeth, Dr. Bakhtyari can design an implant-retained denture for you. It may be permanently fixed in place, or it may be a removable prosthetic that simply snaps onto the implants. It typically takes between four and six implants to support a full denture. The cost of dental implants varies from patient to patient. Preparatory work, the placement surgery, and the restoration phase all come with separate prices. The overall price of your procedure will also depend on how many implants you need and the exact nature of your restoration. When you visit us for your consultation, we can give you a concrete estimate of how much your treatment will cost. We’ll also help you explore resources that may help you afford your procedure, such as insurance or financing. Although implants cost more than alternative treatments, they offer an outstanding value. Their longevity, beauty, and benefits your oral health make them a truly worthwhile investment.